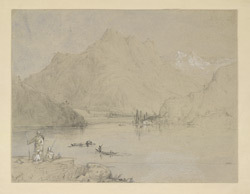 Pencil and wash drawing heightened with white of the Manasbal lake, Kashmir by Charles Stewart Hardinge (1822-1894), dated 1846. Inscribed on the front is: 'Manasa Bal. May/46. Cashmere. Hardinge,' and on the reverse: 'Manasa Lake. The most beautiful lake in Cashmere'. Manasbal Lake is situated in Jammu and Kashmir State, approximately 32 kilometres from Srinagar. The lake is about 5 kilometres long and 1.2 kilometres wide and is the deepest lake within the Kashmir Valley. On the northern shore is a ruined fort built in seventeenth century by a Mughal king to cater for the needs of caravans that used to travel from the Punjab to Srinagar. The lake is considered important for the abundance of lotus flowers which grow on its shores during July and August.